People often ask me to give feedback about their landscape photos. I’ve discovered that nearly every time I comment on some issues, it’s one of the most common mistakes. 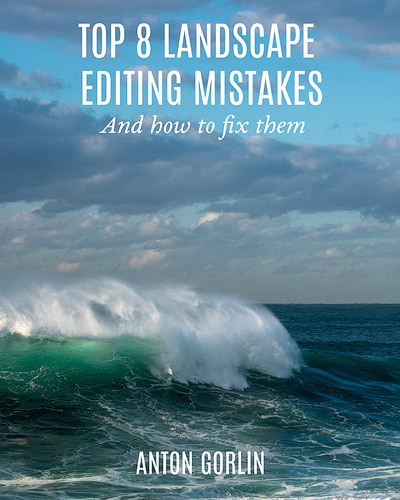 There is a fixed number of issues people do 90% of the time while editing landscapes. So to save everyone some time and spread the knowledge, I have created this little handbook. It has zero fluff inside, just facts and steps to fix. While some of the fixes could seem vague due to the nature of the error, the others include exact steps to perform and ways to improve your thinking. It’s not rocket science but I wish I had a similar guide long ago. Editing is not just a quick fix to the photo, it’s more like a separate kind of art. It is the way to express yourself, to show your vision and voice your feelings. I can’t speak for everyone, therefore, I’ll speak for myself. It took me a couple of years to learn how to create decent compositions and see the photos. But it took me 3-4 times longer to learn how to edit. I’m not kidding, it took me roughly 6-8 years to learn what I do know. I went through every single mistake in this book and it took me months if not years to overcome. You can save yourself an enormous amount of time by spending a single evening browsing through it. This handbook has both good and bad examples, shows problem zones in the photos and gives suggestions. It makes you have a different glance at your art and final results. It is suitable for beginner level and some of the issues are surely good for intermediate level as well. Give it a go and let me know what you think!